Sidney Lumet, the award-winning director of such acclaimed films as "Network," ''Serpico," ''Dog Day Afternoon" and "12 Angry Men," has died. He was 86. 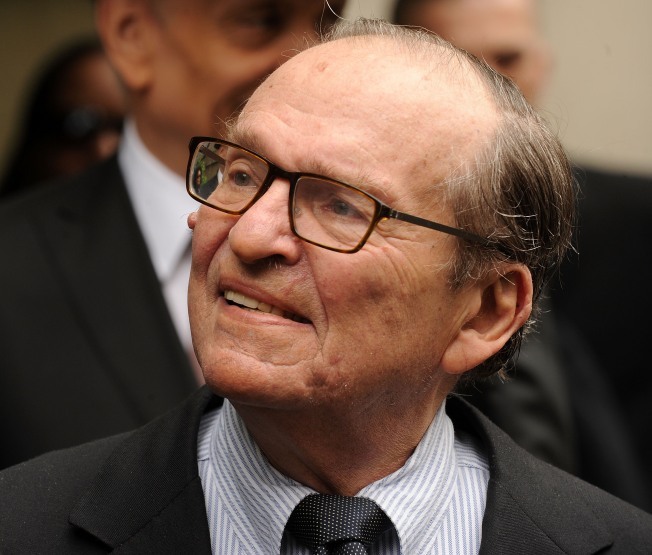 Lumet's death was confirmed by relatives and friends, who said he died early Saturday morning at his Manhattan home. He had suffered from lymphoma. A Philadelphia native, Lumet moved to New York City as a child, and it became the location of choice for more than 30 of his films. Although he freely admitted to a lifelong love affair with the city, he often showed its grittier side. Such dramas as "Prince of the City," ''Q&A," ''Night Falls on Manhattan" and "Serpico" looked at the hard lives and corruptibility of New York police officers. "Dog Day Afternoon" told the true-life story of two social misfits who set in motion a chain of disastrous events when they tried to rob a New York City bank on an oppressively hot summer afternoon. "It's not an anti-L.A. thing," Lumet said of his New York favoritism in a 1997 interview. "I just don't like to live in a company town." Although he didn't work in Los Angeles, the director maintained good relations with the Hollywood studios, partly because he finished his pictures under schedule and budget. His television beginnings had schooled him in working fast, and he rarely shot more than four takes of a scene. He was nominated four times for directing Academy Awards, and actors in his films won 17 Oscars. But Lumet himself never won. "I'm also not a competitive man, but on two occasions I got so pissed off about what beat us," he told The Associated Press in 2006. "With 'Network,' we were beaten out by 'Rocky,' for Christ's sake." That year, the field also included "Taxi Driver" and "All the President's Men." In 1983, "The Verdict" lost to "Gandhi" — a year in which "E.T." also finished as an also-ran. Lumet did receive an honorary Oscar in 2005 for lifetime achievement. He also received the Directors Guild of America's prestigious D.W. Griffith Award for lifetime achievement in 1993. Al Pacino, who produced memorable performances for Lumet in both "Dog Day Afternoon" and "Serpico," introduced the director at the 2005 Academy Awards. "If you prayed to inhabit a character, Sidney was the priest who listened to your prayers, helped make them come true," the actor said. Accepting the award, Lumet thanked the many directors who had inspired him, then added, "I guess I'd like to thank the movies (too)." The composer Quincy Jones, who scored music for five of Lumet's films, said he was devastated to learn of his passing. He told the AP in a statement that Lumet gave him his start in movies in 1963 with "The Pawnbroker." "Sidney was a visionary filmmaker whose movies made an indelible mark on our popular culture with their stirring commentary on our society," Jones said. "Future generations of filmmakers will look to Sidney's work for guidance and inspiration, but there will never be another who comes close to him." Lumet immediately established himself as an A-list director with his first theatrical film, 1957's "12 Angry Men," which took an early and powerful look at racial prejudice as it depicted 12 jurors trying to reach a verdict in a trial involving a young Hispanic man wrongly accused of murder. It garnered him his first Academy Award nomination. Other Oscar nominations were for "Dog Day Afternoon" (1975), "Network" (1976) and "The Verdict" (1982). "Network," a scathing view of the television business, proved to be Lumet's most memorable film and created an enduring catch phrase when crazed newscaster Howard Beale exhorted his audience to raise their windows and shout, "I'm mad as hell, and I'm not going to take it anymore!" Beale, played by Peter Finch, is ultimately assassinated by his network bosses for lousy ratings. "That's the only part of 'Network' that hasn't happened yet, and that's on its way," Lumet later said. It won Academy Awards for Paddy Chayefsky for best screenplay, Finch as best actor (presented posthumously) and Faye Dunaway as best actress. Although best known for his hard-bitten portrayals of urban life, Lumet's resume also included films based on noted plays: Eugene O'Neill's "Long Day's Journey into Night," Arthur Miller's "A View from the Bridge," and Tennessee Williams' "Orpheus Descending," which was made into "The Fugitive Kind." He also dealt with such matters as the Holocaust ("The Pawnbroker"), nuclear war ("Fail-Safe") and the convicted Soviet spies Julius and Ethel Rosenberg ("Daniel"). He directed a highly successful Agatha Christie mystery, the all-star "Murder on the Orient Express," as well. Other popular Lumet films included "Running On Empty," ''Equus," ''Family Business' and "The Wiz." The director was born June 25, 1924, in Philadelphia to a pair of Yiddish stageperformers, and he began his show business career as a child actor, appearing on radio at age 4. He made his Broadway debut in 1934 with a small role in Sidney Kingsley's acclaimed "Dead End," and he twice played Jesus, in Max Reinhardt's production of "The Eternal Road" and Maxwell Anderson's "Journey to Jerusalem." After serving as a radar repairman in India and Burma during World War II, Lumet returned to New York and formed an acting company. In 1950, Yul Brynner, a friend and a director at CBS-TV, invited him to join the network as an assistant director. Soon he rose to director, working on 150 episodes of the "Danger" thriller as well as other series. The advent of live TV dramas boosted Lumet's reputation. Like Arthur Penn, John Frankenheimer, Delbert Mann and other directors of television drama's Golden Age, he smoothly made the transition to movies. Lumet continued directing features into his 80s, and in 2001 he returned to his television roots, creating, writing, directing and executive producing a cable series, "100 Centre Street." It was filmed in his beloved New York. His first three marriages ended in divorce: to actress Rita Gam, heiress Gloria Vanderbilt and Lena Horne's daughter, Gail Jones. In 1980, he married journalist Mary Gimbel. He is survived by his wife, daughters Amy and Jenny Lumet, stepchildren Leslie and Bailey Gimbel, nine grandchildren and a great-granddaughter.